Today is the feast of St Benedict of Nursia (480-547) of the Rule of St Benedict fame, which is the backbone not only of the Order of St Benedict but of the Cistercians and their descendant order the Trappists (the two most enduring mediaeval reform orders), as well as being the rule of life for certain Anglican, Lutheran, and Eastern Orthodox monasteries. Lots of people and blogs are going to be posting about him today, so, rather than add to the noise, I thought I would direct your internet journeys to Benedict instead. I devoted two posts to him as saint of the week; one on his life, the other on the Rule. Posted in time for the feast, Malcolm Guite has written a sonnet for St Benedict. If you’re looking for fresh and brief tastes from this saint, there is the selection of posts of passages from St Benedict at Enlarging the Heart. Also at Enlarging the Heart are the (more numerous) selections from St Bernard of Clairvaux, the paragon of mediaeval Cistercian spirituality (and saint of the week here). 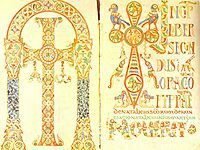 A good resource for the Liturgy of the Hours can be found at Bosco Peters’ site, Liturgy as well as at the website Universalis. I encourage you to spend time with one or two of the links or videos above today, remembering Benedict, and then to draw near to the Christ Benedict points us all towards. He would wish to remembered thus best. I first became aware of Fr. John Behr because I want to read his book The Nicene Faith. I haven’t yet because, quite frankly, the enormity of scholarship about fourth-century Christianity makes me shy away from it and stay happy in the fifth and sixth centuries instead! Nonetheless, I have recently encountered two lectures given by Fr. John. The first I encountered will appeal more to those interested in early Christianity, the core of orthodoxy, and such things; the second is of interest to the same crowd as well as those who do theological anthropology and gender studies. I found the first through a post on Bosco Peters’ excellent website Liturgy. This lecture was part of Augustine College’s annual lectures (the name of the series escapes me), only one of which I attended whilst living in Ottawa, that given by Catholic philosopher Peter Kreeft. He deals with both of these presuppositions quite while, observing that all Jesuses are interpretations of the evidence and experiences of the historical events, coloured by each interpreter’s own cultural presuppositions. We will never be able to reach that ‘real’ Jesus of the Quest for the Historical Jesus. He then makes the interesting shift in interpretation that the early heretics were driven out of a church unwilling to accommodate diversity by arguing that, in fact, people such as Marcion and Valentinian separated themselves from the Church because they found the Church unwilling to silence the symphony of voices and listen only to their monotones. Orthodoxy contains much diversity. Anyone who has read the Fathers would know this, yet presupposition ii. above lies beneath much discourse about early Christianity. One can only hope Fr. John Behr and others of the current orthodox resurgence in Patristics can help dispel these false visions. With the second lecture, I was a bit more out of my league. I don’t even think I can properly reiterate his thoughts without getting into hot water with gender studies people. But it was a good, challenging talk! He addressed the question of men and women and humanness primarily through the Old and New Testaments, but drawing in strands of thought from rabbinical teachings, modern commentaries, modern Orthodox theologians, and the Fathers. I highly recommend it, especially if matters surrounding gender are important to you. It is available through the lovely people at Ancient Faith Radio.